All Saints at Gazeley, near Newmarket, was the first church that I visited after an international team of scientists conclusively proved that God did not exist. Thus begins the original entry for Gazeley parish church on this, the Suffolk Churches site, back in May 2003. 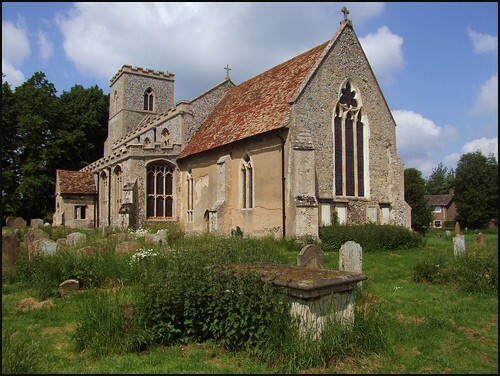 At that stage, I had visited more than 600 Suffolk churches, and the site was moving towards a kind of completion. The entries were becoming longer and tending more towards the philosophical. The acquisition of a digital camera meant that I could already see I would need to do the whole lot again, but that would be in the future. For now, I had Norfolk in my sights, and there was an end-of-term feel to what I was writing about Suffolk. I am afraid that All Saints, Gazeley, took the full brunt of it. The article generated a fair amount of correspondence, as you may imagine. It was discussed on BBC Radio Suffolk. I was questioned rather cautiously about it by someone in the Diocese. The parish themselves took it rather well. To be honest, I had caught them at a low ebb, and they welcomed the publicity. I had also visited them immediately before a time of great change, when heads had fallen, but loins were about to be girded, and the Church of England was stirring itself again in that lovely village. One of the advantages of visiting every parish church in East Anglia is that you also get to see every parish, of course, and I soon fell in love with these sleepy, fat villages along the Cambridgeshire border. I would move there tomorrow, quite happily. I hope I may be allowed the luxury of not rewriting the original Gazeley entry, but instead reprinting it in a slightly briefer form, and adding a postscript. It still makes the point I was originally trying to make, and the contrast between then and now shows this special place in a light it thoroughly deserves, for this is one of East Anglia's loveliest churches, and deserves all the visitors it can get. Anyway, I thought so then, and I certainly think so now. 2003: All Saints at Gazeley, near Newmarket, was the first church that I visited after an international team of scientists conclusively proved that God did not exist. I was intrigued to know how a wealthy, reasonably large Suffolk village would respond to this challenge. What would they do with their church? I had a theory. I suspected that the old church buildings would continue to find a community use. Small groups of people would still congregate on a Sunday mornings to sing comforting songs and feel good about each other. The churches would still be used by secular couples wanting a fancy wedding, and the local villagers would still want to be buried in the graveyard. But the building would no longer have a Christian use. It was with some dismay, however, that I arrived in Gazeley to discover that the rot had already set in. The first sign of this was the way in which the large windows facing onto the road had holes the size of small rocks in them. This was disturbing, especially because the east window at Gazeley is one of the most remarkable Decorated windows in East Anglia. The head of the window consists of two elegant overlapping trefoils, but there is no head to the arch, the head itself having cusps. You can see it in the left hand column; Cautley thought it was unique. I went and tried the door, but of course it was locked. Ever since the announcement of God's non-existence, heads have dropped in the Anglican community, and many of them no longer have the will to welcome strangers and visitors. I went next door to the Rectory. I knocked on the door, rang the bell. Nobody came. Perhaps the Rector had fled town. I was here with DD, who was becoming increasingly frustrated by our inability to raise a key. I had tried phoning several numbers I had taken from the Diocesan website, but nobody had answered. There were keyholders listed in the church porch, but no phone numbers. Gazeley is a fairly large village, and we didn't have a street map, but by driving around (sorry about the carbon monoxide, folks) we tracked some of the houses down. Several cars were on the driveways outside (as I said, this is a wealthy village) but nobody came to the door. Perhaps they had given up in despair. I felt Gazeley's strange torpor beginning to settle on me like snow. We found the house where the last address was supposed to be. I went to the side door, and eventually someone answered. "Yes?" he was very curt, so I don't know who he was expecting. I, however, was a model of charm and good manners, and explained my mission to see inside Gazeley church, and that I understood he was a keyholder, a churchwarden in fact. His wife came to the kitchen door behind him, to see who it was. I could smell cooking, and I assumed that they were both about to eat, the time being 5pm on a Saturday. "The church is locked", he said. I agreed that this was the case, and wondered if access was possible. "It was open earlier today, you should have come then", he observed. I concurred that it would have been better, but that we had been visiting other churches, and had only just arrived in Gazeley. He thought for a second. "I'll have to come with you. How much time will you need?" Now, as at Tuddenham that morning, I was placed in a quandary. Quite simply, I had to lie. If I told him that DD would need at least two hours to document the place, there was no way we were going to get inside. On the other hand, I couldn't very well force the man to sit in the church waiting for us while his dinner got cold. I decided that the best thing to do was to get him into the church and then offer to lock it up for him. The man checked that the twenty minutes I had suggested would not deprive him of his tea, and walked with me up to the church. DD headed off in his Elise and met us there. On the way, the man explained how he and his wife had spent the day preparing the church for the harvest festival. I made a mental note that this was another event that had survived the death of God, as would Christmas probably. We walked across the wide open graveyard, and I looked up at the great ship of Gazeley church. There is no doubt which county you are in; here, the complete rebuilding of the nave with clerestory and aisles was at the start of the 16th century, and as at Blythburgh they didn't get around to rebuilding the tower before the Protestant Reformation intervened. The huge chancel had been built on the eve of the Black Death, and has similarities with the one at Mildenhall. Perhaps a rebuilding was planned, but it never happened. The tower was largely reconstructed in the 19th century. To my surprise, he took us not to either south or north porch, but to the great west door. This led us beneath the tower and behind the organ, and we stepped into darkness. Daylight was fading, but here it must be always gloomy, among the broom cupboards and stacks of junk. The churchwarden found the light switches, and we walked around the organ into the body of the church. Back in the days when God still existed, I had been to Gazeley church before. It had been a bright, cold February morning in 1999, and I was cycling from Newmarket to Ipswich. I'd arrived in Gazeley to find the church open, and had thought it lovely. There was a delicate balance between respect for the medieval and the demands of the modern liturgy. It felt at once a house of prayer and a spiritual touchstone to the long generations. However, the slight crimp in all this was that, at the time, the regular Sunday congregation of Gazeley church had been reduced to single figures. The same was true of neighbouring Kentford. The Rector may not have been to blame; he was very energetic in in his pastoral activities in the village, and people still turned up for the big occasions. But I wondered what effect all this had had, and asked the churchwarden. He was very candid. He told me that they had had a terrible time of it. The electoral roll had fallen to just three people, and this is not a small village. Nobody wanted to come to church anymore. He had lived in the village for years, and had seen all this happen. It was only in the last year or so that he felt the church had been turned around by the new Rector (the one I had suspected of leaving town). Now, there were more than twenty of them, and they felt like a proper community again, he said. I found this interesting. The previous Rector had been a Forward in Faith-supporting Anglo-catholic, and such a tradition was not terribly popular with the suits at Diocesan House. The new Rector had moved the church back towards the mainstream. I looked around the vast open nave. All Saints is one of the biggest churches in the west of the county, and it must take a good five hundred people to make it feel full. I tried to imagine what it must have been like here, just three in the congregation. The warden and his wife had tried hard to decorate the church for the harvest festival, and it looked particularly lovely towards the east. The greenery on the tombchest and piscina was very well done. But inevitably the fruit and vegetables were sparse, and there was no disguising the general air of shabbiness and decay underneath the decoration. I felt a bit sorry for the churchwarden; he had stuck with the place through thick and thin, and clearly loved it. The chancel and central eastern part of the nave were clean and tidy, but all around were the encroaching shadows, and here lurked the dust and dirt. The higher you looked, the filthier it became. The clerestory windows were coated in grime, and the lower parts cloaked in decades of cobwebs. The medieval cross beams are still in place, but the Victorian roof above is leaky, and areas of damp showed above the high arcades. It seemed unlikely that all this could have happened in the short time since the Geneva declaration of 2007 announced all faith in a Supreme Being to be 'utterly null and void'. Mortlock had commented on the poor condition of the royal arms as long ago as 1988. Could it be that they were in this state when this building was still in use for Christian worship? Having seen the stone holes in the windows, I was mightily relieved that the Victorians had reset the medival glass up in the clerestory. This seems a curious thing to have done, since it defeats the purpose of a clerestory, but if they had not done it then we might have lost them. The glass matches the tracery in the north aisle windows, so that is probably where they came from. I had seen them on my previous visit, but could not remember where they were, and when I asked the keyholder he did not seem aware that the chuch had any medieval glass. Eventually I found it. There are angels, three Saints and some shields, most of which are heraldic but two show the instruments of the passion and the Holy Trinity. I would not be surprised to learn that some of the shields are 19th century, but the figures are all original late 15th or early 16th century. The Saints are an unidentified Bishop, the hacksaw-wielding St Faith and one of my favourites, St Apollonia. She it was who was invoked by medieval people against toothache. It struck me as I gazed up that many parish churches had much less to lose than Gazeley. At one time, these places were vibrant hubs of spiritual communities, but now they would be left to wither and die. Some might become houses; Gazeley's church is much too big. Some might be kept as examples of our redundant belief systems, but here at Gazeley there would be too much to tidy up and sort out. So All Saints at Gazeley must be considered merely as a treasure house. Here, then, is a guide to why it must survive the 2007 Geneva Declaration. Firstly, the chancel. Here, the space created by the clearing of clutter makes it at once mysterious and beautiful. Above, the early 16th century waggon roof is Suffolk's best of its kind; Mortlock points out the little angels bearing scrolls, the wheat ears and the vine sprays, and the surviving traces of colour. The low side window on the south side still has its hinges, for here it was that updraft to the rood would have sent the candles flickering in the mystical church of the 14th century. On the south side of the sanctuary is an exquisitely carved arched recess, that doesn't appear to have ever had a door, and may have been a very rare purpose-built Easter sepulchre at the time of the 1330s rebuilding. Opposite is a huge and stunningly beautiful piscina, and beside it are sedilia that end in an arm rest carved in the shape of a beast. It is one of the most significant Decorated moments in Suffolk. On the floor of the chancel there is a tiny, perfect chalice brass, one of only two surviving in Suffolk. The other is at Rendham. Not far away is the indent of another chalice brass - or perhaps it was for the same one, and the brass has been moved for some reason. There are two chalice indents at Westhall, but nowhere else in Suffolk. Chalice brasses were popular memorials for Priests in the 15th and early 16th centuries, and thus were fair game for reformers. Heigham memorials of the late 16th century are on the walls. Back in the south aisle there is a splendid tombchest in Purbeck marble. It has lost its brasses, but the indents show us where they were, as do other indents in the aisle floors. Some heraldic brass shields survive, and show that Heighams were buried here. Brass inscriptions survive in the nave and the chancel, dating from the late 16th and early 17th centuries. Piled up and decrepit in the south west corner are some extraordinary 14th century benches with pierced tracery backs. Some of them appear to spell out words; Mortlock thought one might say Salaman Sayet. The block of benches to the north appear to have been made using sections of the 15th century rood loft. Further north, the early 17th century benches may appear crude, but were almost certainly the work of the village carpenter. The 14th century font is a stunning example of the tracery pattern series that appeared in the decades before the Black Death. They may have been intended to spread ideas at that time of great artistic and intellectual flowering before it was so cruelly snatched away. The cover is 17th century. The place is absolutely glorious, but few people seem to know about it, and fewer seem to care. If it had been clean, tidy and open, Simon Jenkins England's Thousand Best Churches would not have been able to resist it. Should the survival of such a treasure store depend upon the existence of God or the continued practice of the Christian faith? Or might there be other reasons to keep this extraordinary building in something like its present integrity? It needs thousands spent on it, hundreds of thousands, but is this something that we as a nation or culture should consider worth doing? Will it be sufficient to photograph it all and then let it fall, or do we need to rescue this building before it is too late? The churchwarden and I stood and chatted while DD took his photos. Increasingly, it seemed to me that what the parish needed was not condemnation for the state the building was in, but encouragement to put it right. I pointed out several of the features outlined above, but I think the poor man was beginning to register quite what a task he had on his hands, so I fell quiet. I did reassure him that the building really was the responsibility of us all, and not just the Church of England; it was the heart and touchstone of the whole village, and not just of his faith community. We'd been there for nearly an hour. I took pity, and offered to lock up and return the key to his house. He thought about it for a moment. I guessed he was weighing up whether or not he trusted us to make the church secure (he'd seen DD's car, and knew we wouldn't be stealing the font). "Well, you don't need to bring the key back", he said after some thought. "It's a yale lock. Just let yourself out, and let the door close behind you." And he said goodbye and went home - rather more thoughtfully, I fear, than he had left it. It was dark. DD finished, and we packed up. I put out the lights, and stood for a moment in the wide gloom, in the infinite stillness. I listened to the sound of my own breathing. I knew this was the most endangered building I had visited so far on my travels. But I'm determined we won't lose it. 2008: At the end of the original article, I had pointed out that the 2007 Geneva Declaration on the non-existence of God was, of course, entirely fictitious. This was partly to reassure the good people of Gazeley, but also to save confusing any excitable Dawkinsites. Gazeley church was, after all, still in use for Christian worship. I also pointed out that the rest of the article was completely true as things had stood in May 2003. However, over the next few months I received a number of e-mails from people in the parish telling me how the church was being taken to task, tidied up, cleaned out, and, even more important, made accessible. Coming back in May 2008 I was delighted to discover than both the south and north doors were now open, and I stepped out of the sunlight into an interior which positively shouted its welcome to pilgrims and strangers. Perhaps it helped that it was such a beautiful day; the interior was full of light falling across ancient stone and woodwork. verything shone with love and care. Quite frankly, it lifted the heart. Perhaps the most moving sight was of the brightly coloured children's table and chairs, which have been given pride of place at the east end of the south aisle, rather than being tucked away under the tower or behind the font. Having once almost lost its congregation altogether, the community at Gazeley now puts its children's corner in a prominent position, where everyone can see it. The wide open space of the chancel was still one of the loveliest interiors I knew in Suffolk; but now it had something else, a feeling of hope. Great things had happened here. I mentioned it afterwards to a Catholic Priest friend of mine, and he said he hoped I knew I'd seen the power of the Holy Spirit at work. And perhaps that is so. Certainly, the energy and imagination of the people here have been fired by something. I wanted to find someone to ask about it, to find out how things stood now. But there was no one, and so the building spoke for them. Back outside in the graveyard, the dog daisies clustered and waved their sun-kissed faces in the light breeze. The ancient building must have known many late-May days like this over the centuries, but think of all the changes that it has known inside! The general buffeting of the winds of history still leaves room for local squalls and lightning strikes. All Saints has known these, but for now a blessed calm reigns here. Long may it remain so.